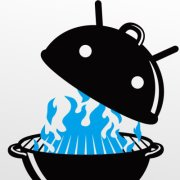 By now, you've probably at least heard about The Big Android BBQ. It's big, because it's in Texas. It's about Android, because we probably wouldn't post about it otherwise. There's BBQ, because who doesn't love BBQ? Honestly, I'm not even sure you need to watch the video. It may be summed up well enough in the thumbnail. The Froyo package includes the following: a BBQ swag pack and one ticket to the event which gives you access to all the sessions, as well as a ticket to the 'BBQ After Party' taking place on Sunday night with all you can eat BBQ and all you can drink beer! Gingerbread package: Everything mentioned above PLUS -- one reserved Key Note seat. You don't have to arrive early or fight for the front row during the most anticipated keynote sessions of the event. PLUS -- Your own line for breezing through the registration line at the beginning of the event. PLUS -- You will get one bottle of Ray Walters' secret rub that he has used on the meat for the last two BBQ events. The Gingerbread package has been going for $100. But you can get it for $50. Remember, though - we only have 100 tickets! After those are gone, it's back to full price. That means you should buy now. Of course, Android Police will be there, represented by yours truly (finally, a perk for living in Texas!). That means I expect all 100 of you who take advantage of this deal to find me so we can hang out. I'm serious. To grab your discounted ticket, use this link. If you'd rather cruise around the BBQ site for a while first, just use the coupon code APBBQ50 at checkout. Now go on - get your ticket!